Why Choose a Material Separator from Hocker North America? Material separators from Höcker North America create a closed loop system. This system keeps heat from being lost during the winter months, and in turn decreasing energy and heating expenses. Hocker’s material separators also feature a smaller design (particularly when compared to cyclone systems). This system filters out air so that it can be returned back into the factory at a 99.9% clean air return rate. 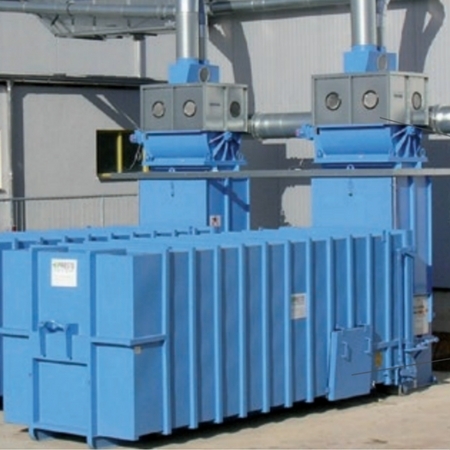 Separators are used in preliminary separation of coarse paper and cardboard wastes. In their various sizes and forms, they represent tailor-made solutions for loading balers, containers and compactors of all kinds. Additionally special versions for foil separation (PMA-F) or airlaid-materials can be delivered as well. The main construction design characteristics of Separators of the PMA Model are unique. One particular feature is the modified rotary air lock with continuous self-cleaning to ensure reliable continuous operation. During operation of the separator, waste and air containing dust are both blown into the machine. Coarse materials are removed using virtually no pressure, due to the integrated rotary air lock– even without a fan. Our separator units are available in six sizes that can be fitted with a wide variety of inlet feeding joints and outlet hoods. For instance, PMA Material Separators can be adopted to different applications and air volumes. Material Separators can be combined with other Hocker components for pneumatic transport and filtration when required. When used in conjunction with our high performance fans, the waste extraction features green, energy saving benefits. Material Separators are resistant to low pressure and take the demands of modern disposal concepts into account. Units are easily integrated with other technology to best meet your unique company requirements.